After concentrating on the economic data for Downtown Indy yesterday, I used the US Census website to map the same sort of data for the entire County. Downtown is both a bit better for income and a bit worse for poverty than the County as a whole. To make the maps as large as possible, I had to cut off the County at the very top and bottom. 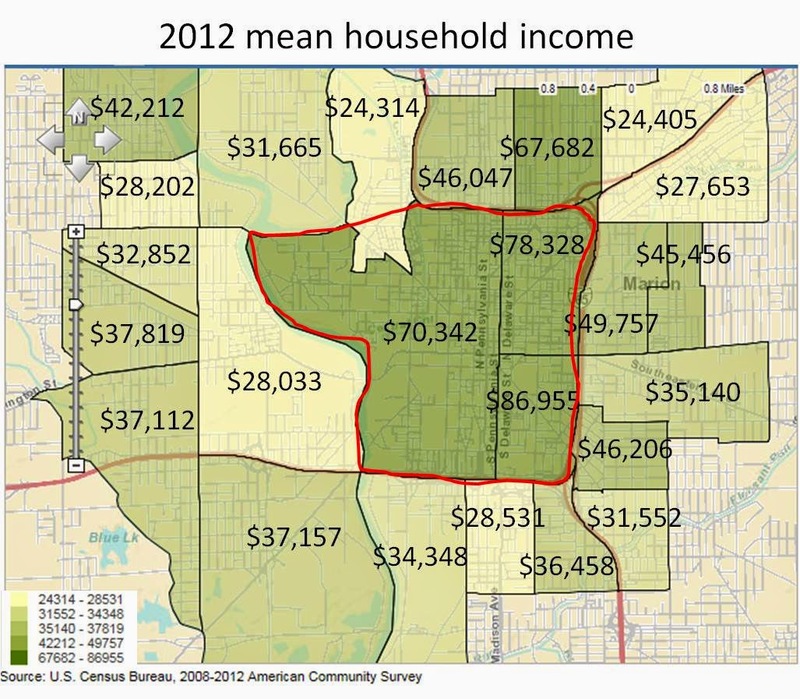 As you can see, when it comes to average household income, Downtown isn't anything special. 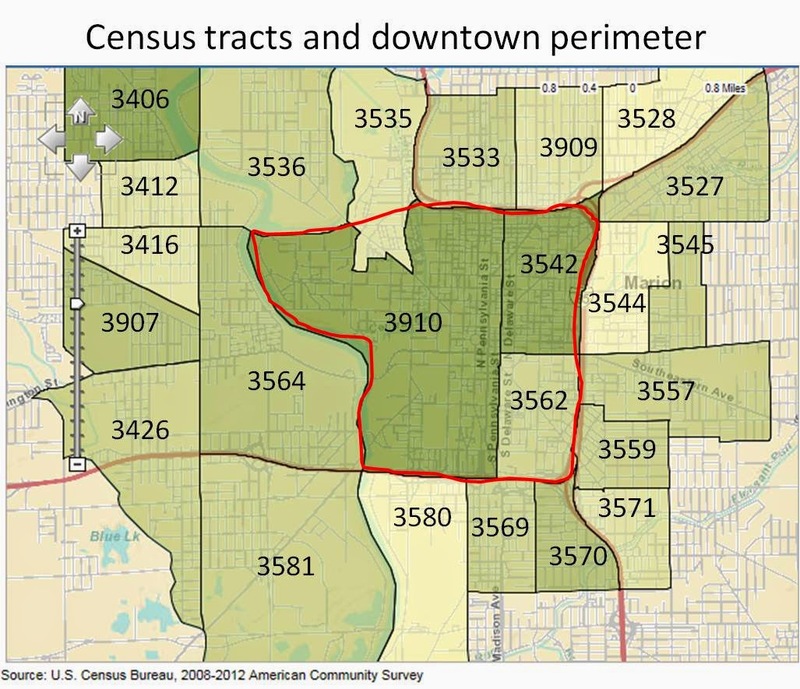 In fact, 5 census tracts in northern Marion County are about twice that of Downtown. Taking the County average for comparison, Downtown does outperform. Again, the five northern census tracts are about twice the income, this time based on a per capita calculation, than Downtown. And again, Downtown isn't unusually high or low compared to other areas of the County. Turning to poverty rates, we see that Downtown is slightly higher than average. The map for the estimated percentage of people who fall below the poverty line is below. The Marion County average is straddled by the three Downtown census tracts. 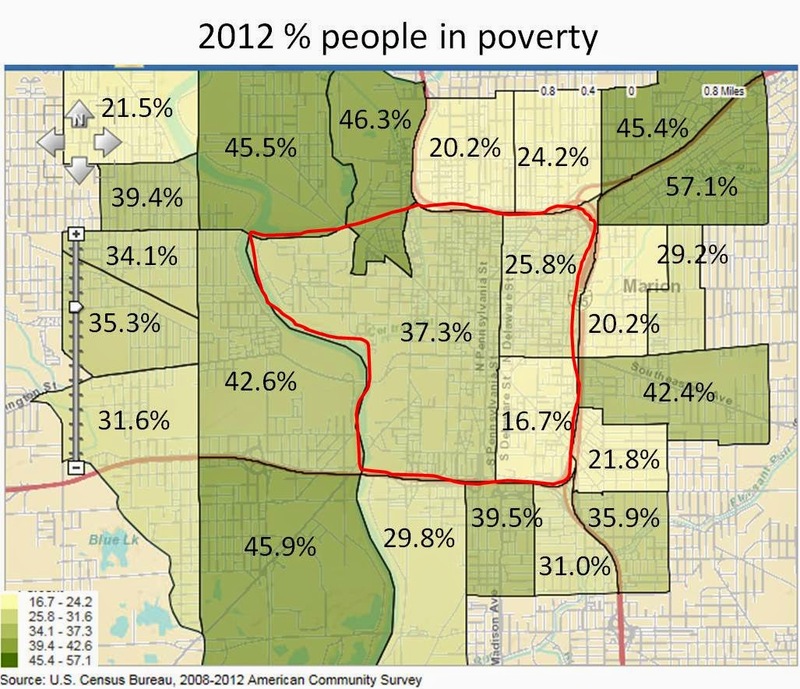 The worst poverty rates surround Downtown. 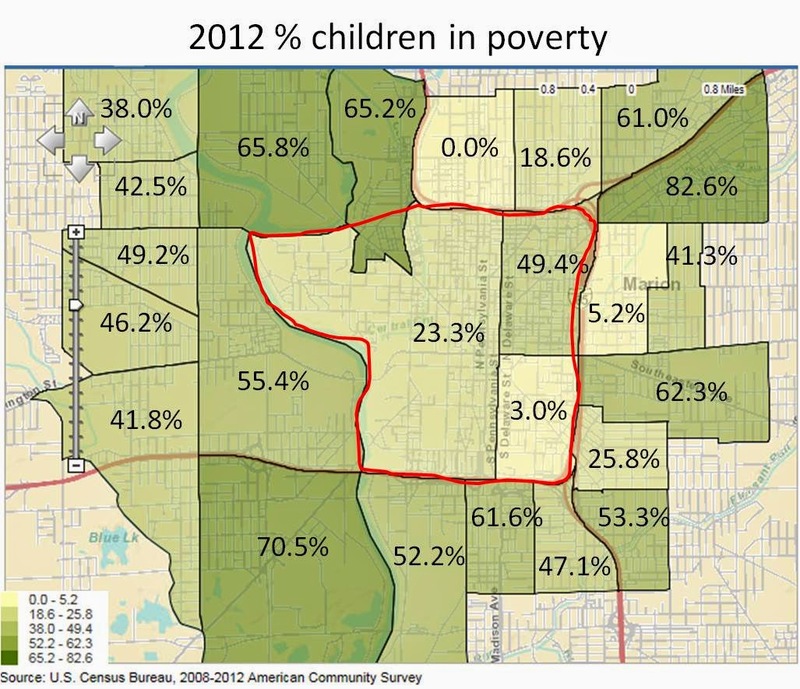 Looking at the situation for children in poverty, we find that Downtown doesn't stand out. The intensity of poverty among children is much higher than the population as a whole, and further spread out beyond the Downtown limits. It is untenable that a fifth of our people and nearly a third of our children live below the poverty line. We have literally spent billions of taxpayer dollars on Downtown and we seem to have created, perhaps, a slight oasis in the center of our County, but not by much. A brief news item by Jeff Swiatek and a follow-up by Erica Smith over at the IndyStar piqued my interest. Indianapolis Downtown, Inc., now apparently going by Downtown Indy, on Tuesday, gave its version of how things are going in their namesake area. I have looked high and low through the Googler, and I have been unsuccessful at finding their report, much less track down the data they relied upon. The US Census does not have 2013 data for areas as small as downtown and nothing for 2014; the most recent are estimates for 2012. So, where IDI got its numbers, I can't begin to guess. According to Swiatek and Smith, IDI reports that downtown is humming along, with thousands of new residents whose household incomes average $90,000 a year, and who are employed in tech jobs. 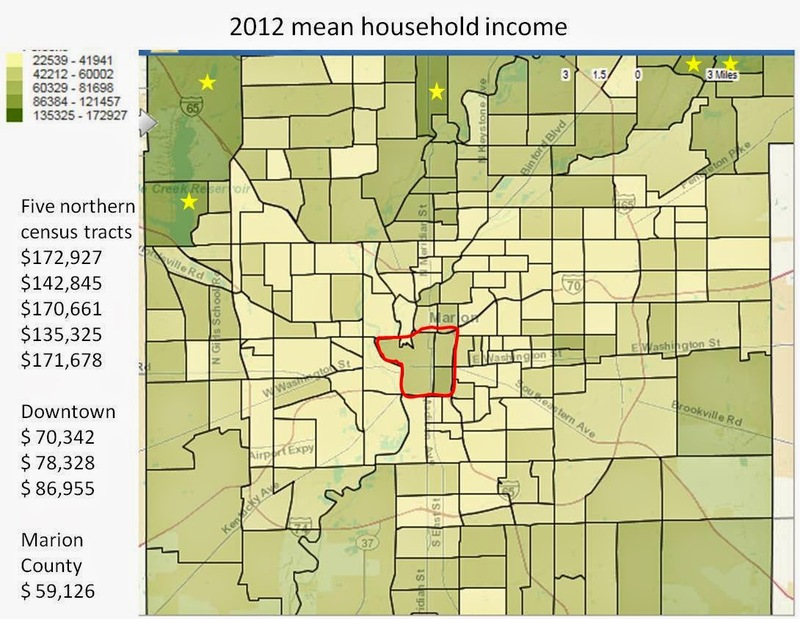 The 2012 data from the US Census gives us a bit broader and more in depth look at the state of downtown Indy and the areas around it. I pulled down the numbers and used the mapping function on the Census website for 24 census tracks. The red line shows the generally accepted perimeter of "Downtown". The numbers shown are those of the Census Tracts. Downtown is composed essentially of three census tracts - 3910, 3542, and 3562. Since Smith effused about all the tax money generated by Downtown residents, I feel I must add that property taxes are also used to fund police, fire, and equally important, schools. Here is my best effort in sketching the various TIF districts in the Downtown area. 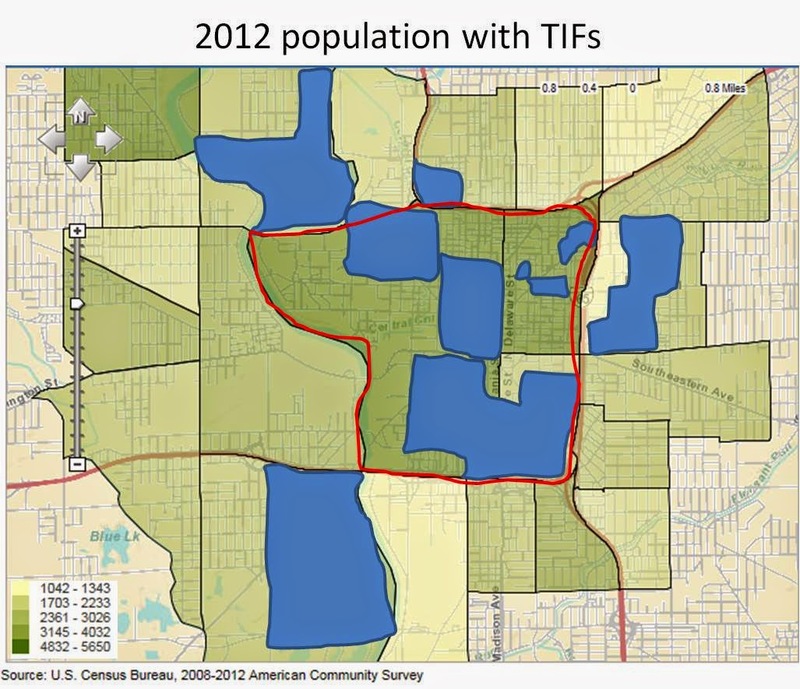 The TIFs are drawn in blue, and the 2012 estimated population is mapped. The claim of an average household income of $90,000 is a bit high, compared with the 2012 US Census estimates, but not too much higher. 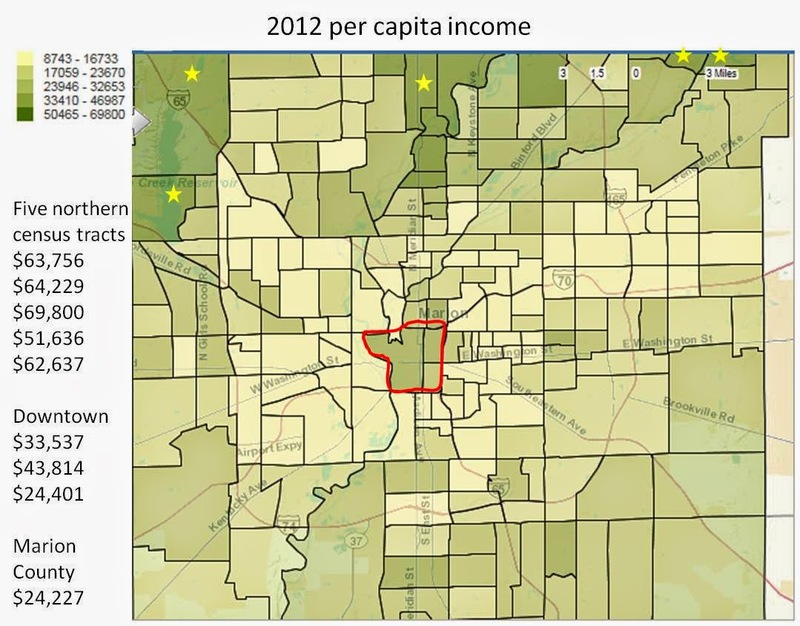 Note that the three Downtown census tracks top the household income in the immediate area. But, that is only one way to look at income. Another is a per capita view. This is mapped below. 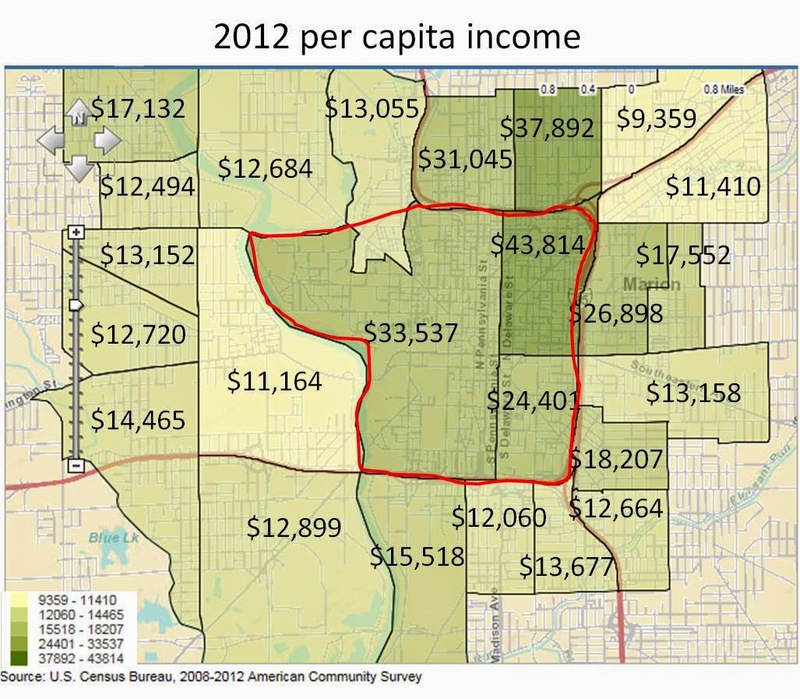 Viewed on a per capita basis, the income levels of the three downtown census tracts drop to numbers 1, 3, and 6. One cannot look at income without looking at poverty rates. 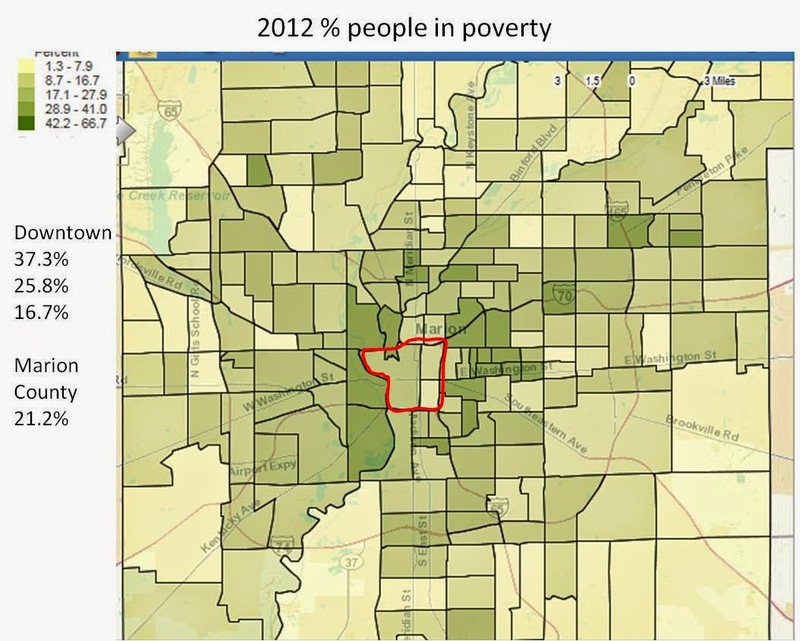 The percentage of people living below the poverty line in each census tract is mapped next. I find these poverty numbers stunning in how very high they are. Downtown clearly is not spared residents who live below the poverty line. The data are generally worse when you look at the poverty rate among children. 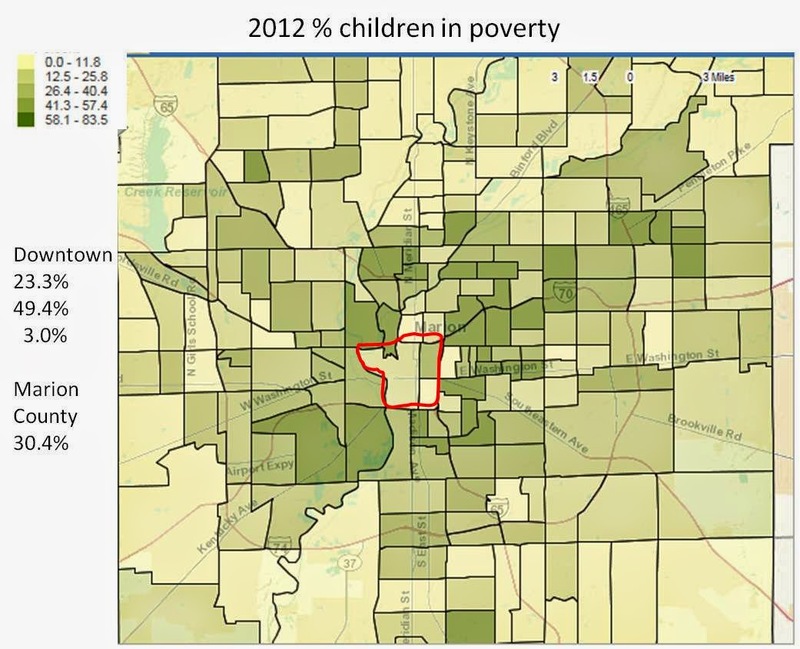 Only three of the 24 census tracts show lower poverty rates for children than the general population, and two of those are Downtown census tracts. What of the claims of tech jobs? The Census has a few categories, but the one that seemed to fit the claims best included management, business, science, and art occupations. The percentage of the workforce engaged in these jobs are mapped below. The percentage of those in the service industry are mapped next. So Downtown residents do hold more management and fewer service types jobs than the surrounding areas, generally. What of the unemployed? 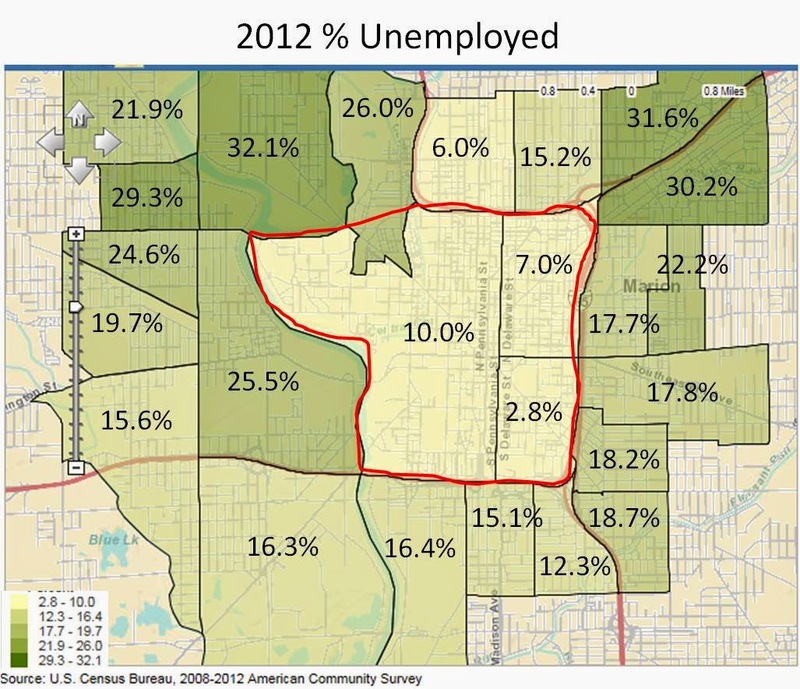 The unemployment rate is mapped here. There are some shockingly high unemployment rates right against Downtown. The jobs being generated do not appear to be helping much beyond Downtown's perimeter. While IDI likes to be a cheerleader for Downtown, the entire picture is somewhat different. By some indicators, Downtown does appear to have a better financial footing for its resident households. However, unabated enthusiasm isn't warranted when one looks at per capita incomes, poverty, and unemployment. One would hope that the City's goals are to move everyone forward, and not just those who become attracted to new residences springing up thanks to taxpayer funded inducements. To do that, we need a bigger view of Indianapolis than just the 2.6 square miles of Downtown. I am so very weary of the fleecing the taxpayer gets under the Ballard regime. The latest example is the belatedly announced deal to lease 425 plug-in hybrid and all electric vehicles for seven years, now dubbed by the well worn PR firm as the "Freedom Fleet". Reported yesterday by the IBJ's Kathleen McLaughlin, but inked down back in February (before the company was an Indiana entity, by the way), the City has entered into a lease arrangement with Indy Vision - with the City being the company's very first customer ! Gary Welsh over at Advance Indiana wrote about this deal and the owner of Indy Vision. Paul Ogden at Ogden On Politics challenges the administrations numbers. Ballard is swapping out 536 gas powered vehicles that the taxpayers OWN for a seven year lease for 425 gas/electric vehicles. They tell us that they estimate the cost of keeping the 536 fleet at $9000 per year per vehicle, but leasing the 425 fleet drops the cost to $7400 per year per vehicle. The $1600 per year per vehicle savings come from the reduction in number of cars and savings on operating them. Quick math tells us that any savings the taxpayer will see comes entirely from dropping 136 cars from the fleet. This reduction saves $1,224,000 per year or $2880 per year per vehicle in the new fleet. Simply by supplying fewer vehicles, Indy Vision will profit $1280 per vehicle per year BEFORE any other savings, profits and tax credits are counted. If the existing fleet of 536 cars was replaced by 425 cars - the taxpayers would save AT LEAST $2880 per vehicle per year in the new fleet. And, the taxpayers would OWN the fleet. If the existing fleet of 536 cars is replaced by a lease of 425 cars - the taxpayers will save $1600 per vehicle per year in the new fleet. There would be no taxpayer asset. Ballard, as usual, is NOT saving the taxpayers a dime. He is, as usual, charging us MORE while enriching a favorite contractor with the difference. I'm going to go all Edith Bunker on you, but please bear with me. Paul Ogden was just a quintessential Indiana nail. I used to work for a company that was spun off a major American company. Eventually it was bought by a major Japanese company. During those years I had one particular conversation that stuck with me. One of the representatives of the parent firm said that the reason they liked to collaborate with and buy out Indiana companies was the similarity in the social culture. That kind of took me by surprise and befuddled me. He went on. In Japan, he said, there is an old saying that translates to - "the nail that sticks up, gets hammered". That social culture is what they found here. Fellow blogger, Paul Ogden, a lawyer who just recently put his law degree on the inactive list, was the nail that stuck up. With regularity he used his blog to expressed his opinions on many things legal - from untoward recruitment practices of law schools, to self-serving methods of certain high power law firms that run the City government contract by contract, to telling the stories of unpowerful people caught up in the powerful legal system. He cared enough to say out loud what other lawyers just mumble under their breath, if they notice at all. Ogden was the nail that stuck up. In a complaint jumped on by the so-called Disciplinary Commission, running its course over the last couple of years, powerful enemies tried to just push him out. They waved around an email, making claims of ex parte communications and (GASP !) criticism of a Judge. They piled on accusations. He pressed on, taking it all the way to the Indiana Supreme Court. The Court sided with Ogden on all the major points. Nonetheless, the Supreme Court in an opinion written by Chief Justice Brent Dickson issued a 30-day suspension rather than a public reprimand because it found Ogden had been "obstreperous" rather than "cooperative" during the matter, which essentially means he contested the charges brought against him. The Court, while siding with Ogden on 80% of the matters, crippled him with an unitemized and onerous bill of $10,000. Faint praise. The image of the Disciplinary Commission is toast at this point, as far as I'm concerned. They ignore real legal rogues all the time. They chose, instead, to hammer Ogden. The Court's image isn't doing all that much better. Any citizen would hope they were somehow elevated. But, they don't seem to be. They have done nothing to rein in the excesses of the Disiplinary Commission and managed to accomplish the very end desired by the Commission, by invoking a sort of debtors prison from which Ogden could not escape. The Court just picked a different hammer to deal with the nail that stood up. In the end, Ogden can hold his head up. The others, should they have a conscience, cannot.